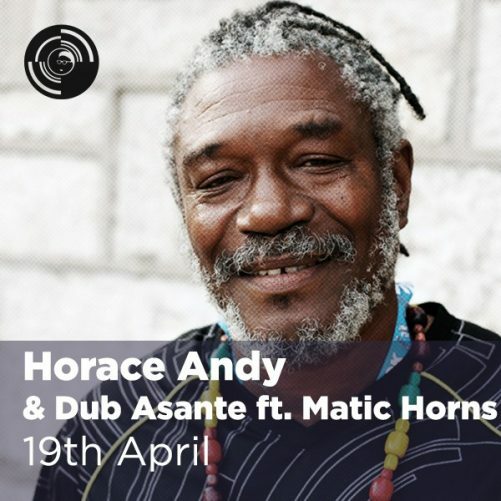 A legendary voice in reggae history, Jamaican roots legend and Massive Attack collaborator Horace Andy returns to Band on the Wall with long-time band Dub Asante ft. Matic Horns. Possessing what must be one of reggae’s most beautiful voices, Horace Andy emerged as a major force in the 1970s when his collaborations with producer Coxsone Dodd and, later, Bunny Lee resulted in a series of songs now considered classics including You Are My Angel, Skylarking, Just Say Who, Don’t Try To Use Me, Zion Gate, I’ve Got to Get Away and Something On My Mind. Later hits include the much-loved singles Government Land and Do You Love My Music and seminal album In The Light. In 1990 his long-standing collaboration with Trip-Hop pioneers Massive Attack began which resulted in him contributing to all five of their albums – most notably with Angel on Mezzanine and Five Man Army on Blue Lines. Horace Andy continues to be one of reggae’s brightest voices and most loved stars so join us at for what promises to be a wonderful night of blissful music. Backing him are the powerful Dub Asante band ft. Matic Horns, one of the tightest rhythm sections you’ll find in the UK, to bring the full live feel to this classic catalogue. This show will be followed by a reggae clubnight. Did you know that our Picturehouse Cafe Bar is open beforehand for delicious food and drinks?